The current club was formed following the liquidation of Airdrieonians in 2002. Airdrie United have changed their name to that of their predecessors Airdrieonians. The club, relegated from the First Division this season, will see the name change come into effect for the 2013/14 season after being given permission by the Scottish FA. 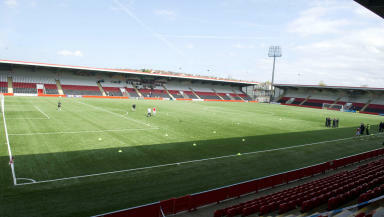 Airdrieonians were liquidated in 2002, leading to the creation of Airdrie United in an attempt to keep senior football in the town. "When the old company went into liquidation, it was in a different football environment and the use of the name was not possible at that time," Airdrie chairman Jim Ballantyne said in a statement. "With all the recent changes however, and subsequent rulings, it paved the way for us to make the move and therefore we set the wheels in motion. "It was actually raised at a fans meeting a few months ago but we could not give too much away as there was still much work to be done. "However with the support of last year’s club sponsors. E & A Heating Ltd, we were able to progress matters to a conclusion. "Formal SFA clearance was finally granted at the recent meeting of the Professional Game Board". Following Airdrieonians' liquidation, the new club were unsuccessful in gaining entry to the Third Division, with Gretna being given the place instead. Airdrie United were then given permission to purchase ailing Clydebank, inheriting their Scottish FA membership and changing the club's name.